What Are Mass Murder Pills? CNN even mocked the line in an article the outlet posted yesterday. But can Alex’s comment be so easily dismissed? Americans consume more psychotropic drugs than any other country in the world. According to the Centers for Disease Control and Prevention (CDC), prescriptions for antidepressants had risen in this country by 400 percent since 1988. New research was based on old research which showed that 11 percent of Americans over the age of 12 take antidepressants, otherwise known as Selective Serotonin Reuptake Inhibitors (SSRIs). Antidepressants were ranked the number one most common prescription for all adults age 18-44, and 60 percent of Americans who take SSRIs stay on them for more than two years. At the start of the decade, the fasting growing class of antidepressant users was preschoolers. Antidepressants and other psychotropics are prescribed “on-label” — or uses approved by the Food and Drug Administration (FDA) — for psychiatric issues such as depression, anxiety and personality disorders (“off-label” use for issues like hyperactivity and sexual disorders is obviously not regulated). Side effects of these drugs can include confusion, hallucinations, anxiety, agitation, mood swings, impulse-control disorder, paranoia, psychosis and hostility. A Canadian judge even ruled that SSRIs can cause children to commit murder when he found that Prozac was largely responsible for a 15-year-old stabbing one of his closest friends. Another well-established side effect of antidepressants is suicide. A black box warning is the most serious warning the FDA can place on a prescription medication. The FDA has also admitted that adverse reactions to pharmaceuticals kill over 100,000 Americans each year, and in 2009, the LA Times reported drug deaths — primarily due to overdoses on prescription pain and anxiety medications — even outnumbered traffic accidents in the U.S.
Scientific studies abound. The number one cause of death by injury in America is suicide according to one, just as Alex told Piers Morgan. Military use of psychiatric drugs skyrocketed to one in six according to another. Suicide is now officially the number one cause of U.S. active-duty soldier death, with three times as many soldiers dying from suicide since 2001 than have died in the Afghanistan war. This fact prompted veteran and clinical psychologist Bart Billings to ask Congress for long-term studies into a possible connection between the spike in military SSRI prescriptions and troops committing suicide in record numbers. It should also be noted that Associated Press conducted a five-month investigation and found the drinking water of at least 46 million Americans in 24 major metropolitan areas was already tainted with pharmaceuticals. The report advises, “The federal government does not regulate prescription drugs in the water.” A 2010 study showed that shrimp living in antidepressant-tainted coastal waters were exhibiting suicidal tendencies. There is no way to even speculate the full psychological effects of these drugs being widespread ingested in unknown amounts by an unknowing population in addition to the prescription drugs many people are already taking. 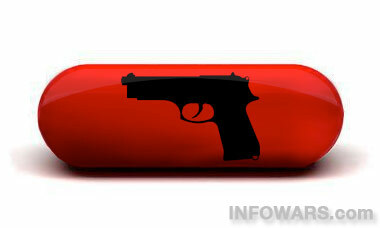 So is there a link between mass shootings and psychotropic medications? The website SSRI Stories.com has compiled a horrifically long list of violent episodes including school shootings, murders and suicides, and linked each event to what anti-psychotic medication(s) the perpetrator was on or withdrawing from. According to a data set of U.S. mass shootings from 1982-2012 prepared by news website Mother Jones, of 62 mass shootings carried out by 64 shooters, the majority of the shooters (41) were noted to have signs of possible mental illness — the precise kinds of mental illnesses that psychotropic medications are prescribed for. Seven more were listed as “unclear” on mental illness status, but many in this group reportedly family members or neighbors who worried about mental health issues. Infowars reported yesterday that, not only was suspected Aurora mass shooter James Holmes under psychiatric care, but police seized four prescription medication bottles from his home after the shooting. The odds at least one of these drugs was an antidepressant cannot be overlooked. As David Kupelian reported for WND, there’s a “giant, gaping hole” in the media’s reporting of the Sandy Hook shooting: discussion of mass killers on psychotropics. “It is simply indisputable that most perpetrators of school shootings and similar mass murders in our modern era were either on – or just recently coming off of – psychiatric medications,” Kupelian wrote. Newtown school shooting suspect Adam Lanza has also been described as having a “personality disorder” and a “mental illness,” phrases Mike Adams of Natural News points out are typically used to describe people who are prescribed psychotropic drugs. Natural News also reported on the untimely death of prominent gun manufacturer John Noveske on January 4, 2013. 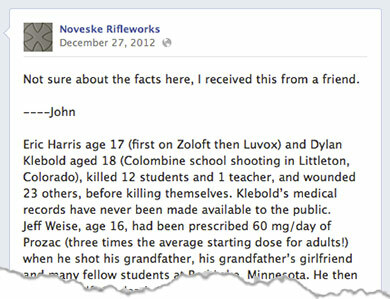 Just days before he died in a car wreck, Noveske posted a lengthy list on his Facebook page of over 40 incidents where primarily young people committed mass murder and/or suicide; almost all of them were on psychiatric medications. Many of the killers Noveske listed were under the age of 24; recall, young people fall in the category of increased risk of antidepressant-induced suicidal tendencies which prompted the FDA to require the updated black box warning. Noveske’s last post in its entirety is included at the bottom of this article. Pharmaceutical commercials dominate the airwaves, imploring us that if we are “feeling down” we might have depression and there are a wide array of prescription medications we could all take to help us feel better. The announcers in these commercials urge us to, “Ask your doctor today” if these drugs can help us. Of the top ten prescription drugs linked to violence toward others, a 2010 study based on FDA adverse reaction data show that five were antidepressants and two were for the treatment of attention deficit hyperactivity disorder (ADHD). Perhaps we should be asking our pharmaceutical manufacturers and FDA why no long-term independent studies have been done on whether or not these psychiatric medications can influence violent behavior, homicidal tendencies and ultimately, mass murder. Why is the mainstream media so quick to attack and demonize the Second Amendment and lawful gun owners full-force in the wake of the Newtown school shooting without even discussing the potential role pharmaceuticals play in these kinds of horrific events? “Eric Harris age 17 (first on Zoloft then Luvox) and Dylan Klebold aged 18 (Columbine school shooting in Littleton, Colorado), killed 12 students and 1 teacher, and wounded 23 others, before killing themselves. Klebold’s medical records have never been made available to the public.